Hi there my crafty friends! I have a trio of cards to share with you today using this super cool stamp set called, Abstract Christmas. I wanted to play around with the colors a bit and see how many different looks I could get. 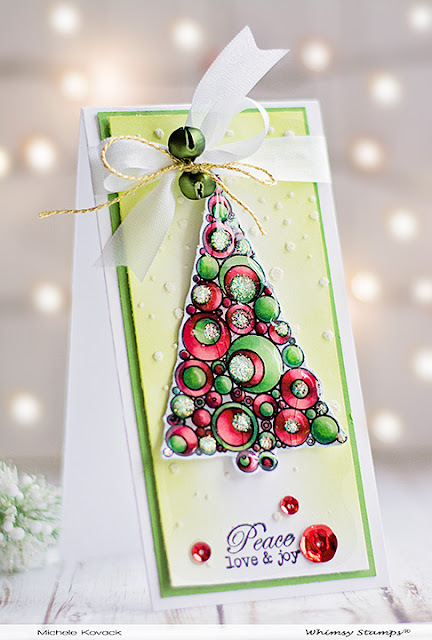 This first card uses the very traditional color scheme of red and green. The tree was colored with Copic markers and cut out using coordinating die. I covered the entire thing with glossy accents. Once it was dry, I couldn't leave well enough alone, so I added Stickles Glitter glue on top of several circles. The background was done with green Tim Holtz ink. The "snowflakes" were added with the Polka Dot stencil and texture paste. 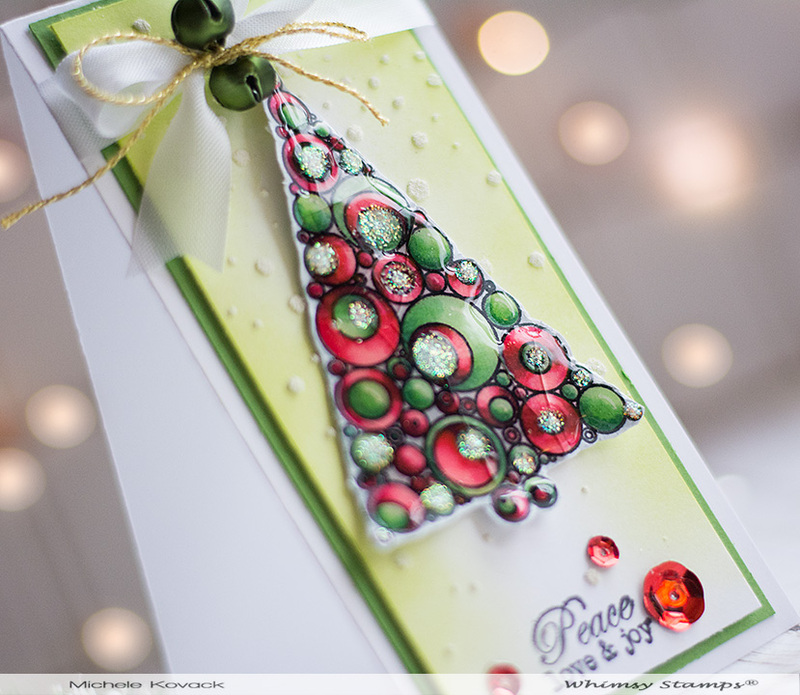 The sentiment was done using the Christmas Mini Tag Sentiments set. I added white ribbon tied with jingle bells. Lastly, I adhered a few coordinating sequins. For my next card I used various pastel shades of Copic markers to make a softer version of the card above. For my last card I used shades of red and aqua. There is something about this color scheme that says "retro" to me. Here is a last look at all 3 cards! Thanks for sharing! beautiful card! 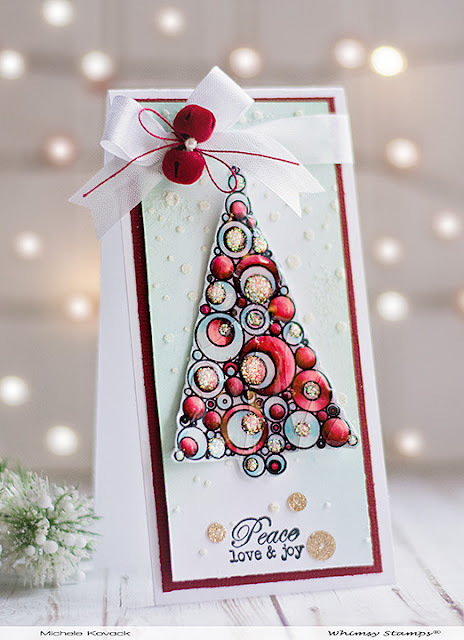 Those Xmas tree cards are exquisite and unique. Thank you for sharing and inspiring. Thanks for joining us here today at the Whimsy Stamps Blog. We hope you become inspired to visit with us again and again. Thanks for leaving your comment. This is a blog dedicated to bringing you Whimsy inspired creations and special projects! Here you will find cards, scrapbook pages, special projects, and tutorials created by our Whimsy Stamps Creative Team. 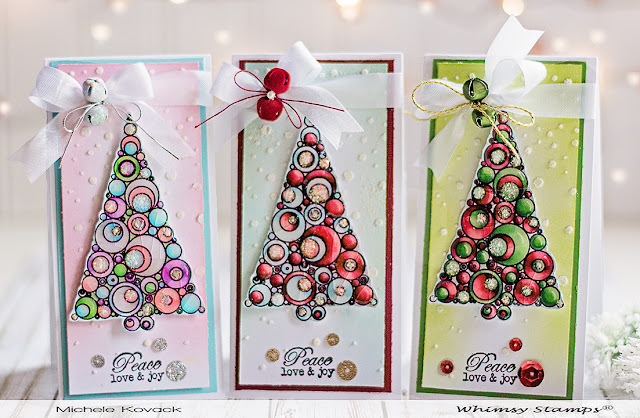 Each project will contain products available at Whimsy Stamps. We hope to inspire your creativity too! 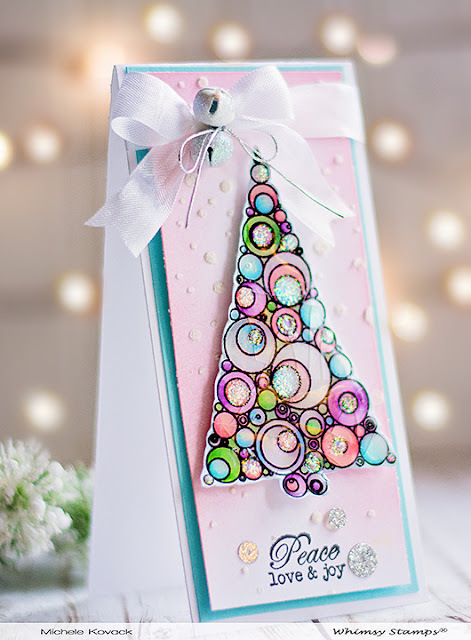 Throughout the month, our Whimsy Stamps designers will each post their Whimsy inspired creations with details and how tos.